By Scott Gilfoid: Anthony Joshua says Dillian Whyte needs to focus on his cardio for him to defeat former WBO heavyweight champion Joseph Parker this Saturday night. Joshua states that he wants Whyte (23-1, 17 KOs) to defeat Parker because that would setup a big rematch between the two of them. 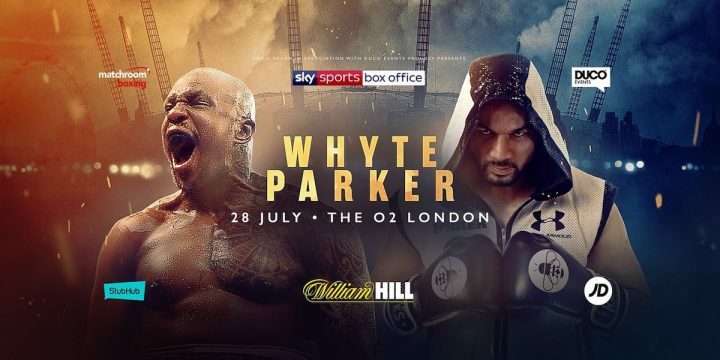 Parker will be the visiting fighter this Saturday night against Whyte at the O2 Arena in London, England. This is a Matchroom Boxing promoted card, and it’ll be televised on Sky Sports Box Office pay-per-view. Despite the contest not involving world champions, the British boxing public is excited about the fight and looking forward to purchasing it. Unfortunately the undercard has taken a big hit with Kell Brook and Sam Eggington both pulling out of their respective fights due to injury related problems. Fans will have to be satisfied seeing fights like Dave Allen vs. Nick Webb. I’m not sure if that fight is worthy of Sky Box Office PPV, but oh well. Parker (24-1, 18 KOs) lost a 12 round unanimous decision to Joshua earlier this year on March 31 at the Principality Stadium in Cardiff, Wales. Joshua thinks that the sole reason for his victory over Parker is because he matched his speed and was able to keep the fight on the outside. Many of the boxing fans that saw he fight have a different opinion. They believe that the only Joshua won is because the referee stopped Parker from fighting on the inside by pulling him away from Joshua when he was trying to work in close. Joshua, 28, is correct when he states that the reason why he defeated Parker is because he kept the fight at range. But what Joshua doesn’t say is WHY he was able to keep the fight on the outside. Joshua fails to mention the HUGE part the referee played in the outcome of the fight by him not letting the two fighters battle on the inside. Since Joshua was the taller and longer-armed fighter of the two, he had a big advantage when Parker was on the outside. Parker had to be in close for him to land his shots, and on the night, he couldn’t get close to Joshua without being pulled away by the referee. Needless to say, the fight was badly tainted due to the referee having such a huge impact in how the fight would play out. ”If I want someone to win it would be Whyte because that would set up a future fight for us,” Joshua said. Well at least Joshua is up front in saying that openly he wants Whyte, 30, to win the fight. Whyte is from the UK, whereas Parker is from New Zealand. There’s obviously more money involved in a Joshua vs. Whyte rematch than there would be in a Joshua-Parker fight. Besides that, Joshua has a much better chance of beating Whyte than he does in defeating Parker. Other than round two, Joshua dominated Whyte in rounds 1, 3, 4, 5, 6 and 7 in their fight on December 12, 2015. Joshua stopped Whyte in the 7th round in their fight at the O2 Arena in London, England. Whyte has won his last seven fights against carefully selected opponents. Even if Whyte had lost two or three of those matches, the fans would still likely be excited about seeing a rematch between him and Joshua. I don’t think it matters. Promoter Eddie Hearn could probably stick a domestic level fighter in with Joshua and sell 70,000 tickets for Wembley Stadium. The thing that Whyte has going for him is he has name recognition, he’s a big talker, and he’s got a seven-fight winning streak. It’s irrelevant that Hearn hasn’t matched Whyte against anyone dangerous during that seven-fight streak. The only thing that matters is Whyte has won his last seven fights. Browne, 39, is a former WBA World heavyweight champion, but he looked overweight, slow and old in his fight against Whyte in March of his year. Anyone that saw how bad Browne looked in against Whyte would find it difficult to make an argument that he belongs in the top 15 in the heavyweight division. Browne looked and fought like an aging journeyman against Whyte. The only other notable fighter in that bunch is the 6’6” Helenius, 34, but he’s an aging fighter that had recently been knocked out in the 6th round by former world title challenger Johann Duhaupas last April. You can’t compare Helenius to some of the top heavyweights in the division. Whyte has things on his side with the Parker fight taking place in the UK. As such, Joshua might get his wish with Whyte winning a decision. Hopefully the results aren’t controversial though. That would be bad if it were. Joshua is still counting on Deontay Wilder agreeing to the $15 million offer from his promoter Hearn to face him early next year on April 13 at Wembley Stadium. Joshua sees no reason why the fight won’t get made, as long as Wilder agrees to the $15 million offer, which won’t be changed. This is a take it or leave it offer by Joshua and Hearn. That’s obviously not the way that a fighter wants to negotiate, but Joshua is playing his A-side to the hilt with Wilder. It’s ham-handed method of negotiating for sure, but that doesn’t seem to bother Joshua. He’s betting that Wilder will ultimately agree to it, and if he doesn’t, he’ll likely face fellow Matchroom fighters Whyte or Jarrell ‘Big Baby’ Miller. Joshua has a fight that he needs to get out of the way first before he can turn his sights to his April 13 fight next year at Wembley Stadium. Joshua (21-0, 20 KOs) is defending against former WBA heavyweight champion Alexander Povetkin (34-1, 24 KOs) on September 22 on Sky Box Office at Wembley Stadium. Povetkin is Joshua’s mandatory. “I don’t honestly see a reason why the Wilder fight will not get made. It’s like telling the kids there ‘aint no Santa,” Joshua said. “I don’t believe this fight shouldn’t happen next if I get past Povetkin. We came close a few times to getting it done. We’ve actually got months and months of history to play with to get it done so I don’t see why not. I’ve signed the contract already. When Wilder ranted with that social media stuff ‘Hey man I’m signing the contract’. No, no, get it done, and then we’ll announce it,” Joshua said. There is a lot of time for Joshua and Wilder to get the fight done, but that doesn’t matter. If Joshua and Hearn are unwilling to increase the $15 million flat fee offer they’re giving to Wilder, they can wait forever and the fight isn’t going to get done. Wilder has dug his feet into the sand and is only willing to accept a 50-50 purse split. Hearn is going to need to come better if he wants Wilder to agree to the fight. I think he might agree to the flat fee if it’s huge money in the $30 million range, but he clearly isn’t going to agree to just $15 million for a fight that could make huge amounts of money. Joshua would be extremely naive if he believes that Wilder will change his mind and agree to the $15 million flat fee offer. It’s possible that Joshua isn’t serious about really wanting the Wilder fight. A flat fee offer of $15 million for a fight that could pull in $100 million is a sign that Joshua and Hearn aren’t seriously interested in making the Wilder fight happen at this time.